In the last of a series of articles on the violence in southern Thailand, the BBC's Kate McGeown looks at efforts to combat the separatist insurgency. You do not need to spend long in Thailand's deep south to come across a soldier. They are everywhere - escorting children to school, accompanying monks as they collect alms, manning roadside checkpoints or simply driving around villages trying to prevent any trouble. An estimated 20,000 soldiers are currently serving in Thailand's southern three provinces - and the authorities insist such a heavy military presence is necessary, to combat the frequent bombing, shooting and arson attacks by the region's secretive separatist insurgents. The authorities estimate that there have been more than 3,000 acts of violence in the past three years, resulting in the deaths of more than 1,300 people. But while the army and police are meant to be keeping the peace, many people accuse them of making the problem worse by using excessive brutality against the local Muslim population. One of the worst such cases happened in October 2004, when 78 people suffocated in the back of army trucks after being arrested in the town of Takbai. In another incident, a clash between locals and security forces at Krue Se mosque left 32 people dead. Locals Muslims complain that, even day-to-day, the security forces still treat them as enemies, shooting first and asking questions later. 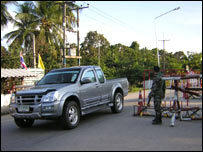 "People here are still scared of the army and the police," said one man in the town of Narathiwat. This is a view that local army commander Lt Col Narong Suankaew wants to change. "The main priority for us now is to go inside the local community so people believe and trust us, and feel more secure. We believe that 99% of local people are good people. It's just a tiny group that causes the problem." Lt Col Narong says his policy is already yielding results, with soldiers being given access to several areas which the locals had previously refused to let them enter. He also said that even though the army had recently been given new powers under a special emergency decree, he did not always think it was right to use them - especially for minor cases. "On Friday, a local bridge was bombed. I know who did it but instead of arresting the people involved, I decided to talk to them first," he said. "When they are ready to confess, they will." But the security forces still face a huge battle to win the trust of the people they are meant to be protecting - not least because one of the main aims of the insurgents seems to be to implicate the military in their own attacks. "In the past some insurgents have dressed in army uniforms, so people think that soldiers committed the attack," said Lt Col Narong. "In fact we recently arrested three people and found that they had uniforms in their homes." Another problem is that the majority of soldiers and police in southern Thailand are actually from other parts of the country, on one or two-year postings to the area. "It would be better to have troops from around here," acknowledged Lt Col Narong. "We're training more people from the south at the moment." The government has tried many different tactics to solve the problem - from hard-line crackdowns to pouring money into the area. One of the most bizarre ideas was a mass air drop of millions of paper birds in December 2004, as a gesture of peace. The plan was co-ordinated by Souriya Tawanachai, who has stayed in Narathiwat ever since, to run a Peace Foundation persuading people suspected of being part of the insurgency to work within the law rather than go into hiding. "I had to stay here - I saw so many people with problems and I just had to help," said Mr Souriya. A more recent government initiative was the formation of an independent National Reconciliation Commission (NRC), tasked with compiling a report on the situation in the southern provinces. The conclusion was published in June and contains a series of radical proposals, including the creation of a new regional body to mediate the conflict, the adoption of the Malay dialect Yawi as an official second language and the implementation of Sharia law. So far, the response has been lukewarm, according to Professor Piya Kittaworn, a political scientist and one of the report's authors. He said the army had been keen to implement the recommendations, but the government was less enthusiastic, and the proposal to make Yawi an official language already looks set to be dropped. "The prime minister has his own way of doing things," said Prof Piya. "He thinks that force can solve this problem, but two or three years have past and the problem has increased and many innocent people have been lost." Ultimately, it seems that whatever approach the authorities take, the key is to win the trust of the local people. Muslim leader Abdul Rahman said it was all a matter of respect. "We have our own language, culture and traditions here," he said. "The government has to understand that." 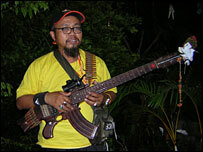 "The insurgency will finish as soon as local people stop supporting the insurgents," he added. "But that will only happen if the government treats Muslim people with the same respect as other Thais."